Hiroshi Teshigahara may have never quite become a household name, but this uniquely talented Japanese filmmaker, who specialized in existential dramas peppered with surreal avant-garde touches, received a large dose of international acclaim for his 1964 Woman in the Dunes, which premiered fifty years ago this week. 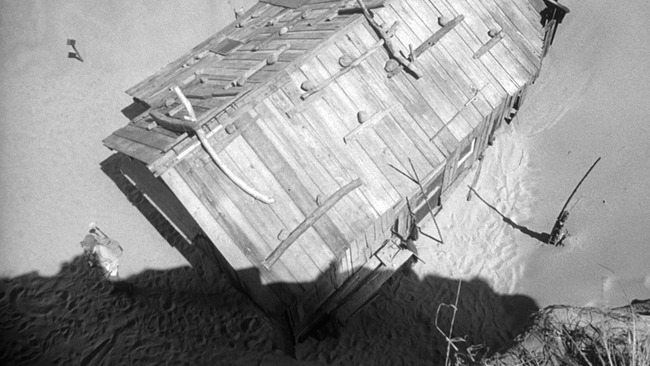 A strikingly photographed, Kafkaesque tale about a traveling amateur entomologist, Junpei (Hiroshima mon amour’s Eiji Okada), trapped like a bug by a widow (Kyoko Kishida) who lives at the bottom of a sand dune, Woman in the Dunes was such an art-house hit in the United States that Teshigahara earned a best director Oscar nomination—competing with such English-language cinema legends as David Lean, Robert Wise, John Schlesinger, and William Wyler. It combines a challenging use of impressionistic visuals and confined spaces with surprisingly accessible storytelling, and it brought Teshigahara’s visionary craftsmanship to a wider audience. Woman in the Dunes is a film of ominousness and sensuous beauty, playing as both psychological thriller and askew romantic drama. Teshigahara shot the film with all the grace, tactility, and geometric precision one would expect of a director who was as devoted to the delicate art of ikebana (flower arrangement) as he was to cinema. Watch the following clip, in which Junpei realizes that escape from this mysterious woman’s home may not easy, to get a sense of Teshigahara’s striking gift for composition.